Описание: Fairyland это курс для дошкольников и младших школьников. Ученики входят в мир фантазий и приключений, где веселые герои помогают изучать английский язык. учебники серии Фейрилэнд рекомендованы министерством образования и науки Украины к использованию в средних учебных заведениях. Fairyland is a new course at primary level. Young learners enter a world of fantasy and adventure where learning becomes a memorable and rewarding experience! Fairyland 1 provides a safe and stable environment where young learners can explore their creativity. Its main focus is on listening and speaking skills, while at the same time it develops young learners’ motor skills through pre-reading and pre-writing activities. 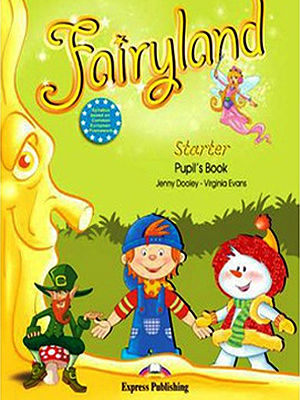 Fairyland Starter is a variation of Fairyland 1 with a gentle introduction to reading and writing in addition to the existing listening and speaking practice. Fairyland Starter also includes the teaching of the English alphabet. In Fairyland 2 young learners continue the magical journey into the English language. It provides carefully selected activities in all four skills that engage learner’s minds and help them communicate in the target language. In Fairyland 3 & 4 the pupils are reunited with the magical creatures in the Magic forest along with a group of four children. The Pupil´s Book and the Activity Book are designed to be covered in approximately 70 to 80 hours of classroom work. Join us and feel the magic! In Fairyland 5 & 6 the characters are given special powers by their magic friends in order to help the world around them. ELF, an electronic life force, joins them in their quest. По мере обнаружения в сети недостающих материалов курса, мы будем добавлять новые ссылки.